Board certified Family Physician Dr. 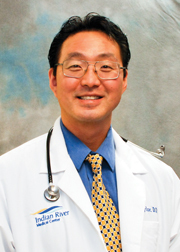 Sung Taylor earned his medical degree from Des Moines University College of Podiatric Medicine and Surgery in Des Moines, Iowa. After medical school, he completed his internship and residency training in Family Practice at the Ohio University College of Osteopathic Medicine in Toledo, Ohio. Prior to joining Indian River Medical Center, Dr. Taylor was affiliated with several medical institutions, including the Third Street Family Health Services in Mansfield, Ohio and Viola Startzman Free Medical Clinic in Wooster, Ohio.